La Scena Musicale: Gripping Il Tabarro and Pagliacci Pairing in St. Louis! Gripping Il Tabarro and Pagliacci Pairing in St. Louis! “A married woman falls in love with a young man, and in a jealous rage, her possessive husband takes his revenge. 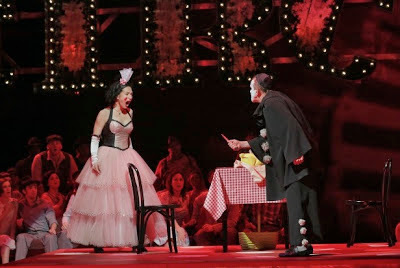 Il Tabarro (The Cloak) and Pagliacci (Clowns). Two operas. The same story:” Brazilian director Ron Daniels succinctly gives us the gist of these two powerful music dramas. What a brilliant idea to present them together in a single evening - a little grim, yes, but wonderfully illuminating! Pagliacci is most often paired with Cavalleria Rusticana. Il Tabarro, as originally conceived by Puccini, was part of a triptych of one-act operas, the other two being Suor Angelica and Gianni Schicchi. This evening’s unusual pairing was a welcome fresh approach. In this instance, Il Tabarro came off as somewhat schematic, upstaged by Pagliacci, clearly the masterpiece. OTSL Has a Winning Formula! I have long admired Opera Theatre of St.Louis (OTSL) for carving out a viable niche for itself in the operatic world. As we all know, opera is expensive. Lavish productions with world-class singers require big donors and big audiences. Too often this process spirals out of control and the company ends up either cutting corners on quality or going bankrupt – perhaps both. In St. Louis, management has found a way to keep quality high and budgets in the black year after year. Now in its 38th season, this organization's success should serve as as model for companies all over the country. Rather than spreading out its offerings throughout the year, Opera Theatre of St. Louis’ presents its season over six weeks in May and June. This year’s programming was typical; a lighter crowd-pleaser (Pirates of Penzance), a well-known opera (Pagliacci), a world premiere (Champion) and an obscure but accessible piece (Smetana’s The Kiss). This is an imaginative mix by any standard. I suspect ticket sales will continue to be strong and, based on the only evening I attended, audiences will be impressed with what they see and hear. 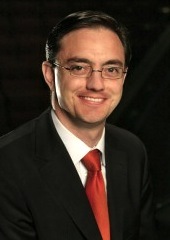 In addition to programming astutely, the management of Opera Theatre of St. Louis (General Director Timothy O’Leary, Music Director Stephen Lord, and Artistic Director James Robinson) has wisely chosen its venue - a small theater on the campus of Webster University in which audience members have the great advantage of being close to the action in any seat, and has engaged singers who, with rare exceptions, are not household names, but are invariably excellent, with fine voices and admirable dramatic skills. To boot, they are nearly always American. Clearly, the company is providing wonderful opportunities for talented young artists here at home. For Il Tabarro and Pagliacci, the directors furthered the goal of developing home-grown talent by giving several artists leading roles in both operas. This tactic not only saved money but demonstrated the versatility of the performers involved: Tim Mix, Robert Brubaker and Matthew DiBattista were superb in both operas. Another important element in Opera Theatre of St. Louis productions is the policy of performing operas in English. One could argue that in an era when English surtitles are commonly used by opera companies – OTSL included singing foreign operas in English is no longer necessary to make them intelligible to American audiences, but singing in English is a long OTSL tradition, appreciated by its audiences - so why change? Not only theme, but also set design melded these two operas together. For Il Tabarro, we had a backdrop photo of a Seine river barge taken from Jean Vigo’s 1934 film Atalante. That backdrop was magically peeled away during the prelude to Pagliacci to reveal a circus setting. Il Tabarro is an extremely somber opera about very unhappy people. It has neither the show-stopping arias that audiences have come to expect from Puccini, nor does it offer comic relief. The mood is pretty dark from beginning to end. Singing and acting in this production were on a fairly high level; that said, I did find Tim Mix’s portrayal of the cuckolded barge owner Michele more inward than it needed to be. His murder of both his wife and her lover at the end of the opera seemed somewhat over the top given his character portrayal to that point; I suspect, however, that director Ron Daniels would say “That is exactly the point! This is a man seething with suspicion who explodes when his suspicions are confirmed.” From my perspective, I would like to have seen a little more seething from the beginning. Pagliacci, on the other hand, offers audiences a greater variety of moods and emotions and, in my opinion, much better music as well. Here, director Ron Daniels made a great work even greater. He encouraged his singers to create unforgettable characters and demonstrated considerable ingenuity in extending the playing area beyond the stage into the aisles. Another idea that worked well was having a team of mute clowns act as a sort of Greek chorus commenting in mime on the action. In this opera, Tim Mix was as animated as he was stolid in Il Tabarro. He was outstanding as the fool, Tonio. Robert Brubaker as Canio was totally into his tortured and malevolent character and sang magnificently. To my mind, the truly outstanding performance of the evening - vocal and dramatic - was given by Minnesota soprano Kelly Kaduce as Nedda. In her first aria, I found her hand gestures excessive but during the play within a play she used her hands – and her voice – with remarkable virtuosity. Her high energy Nedda set the drama in motion and made her murder in the final scene incredibly shocking. Kaduce is a riveting presence on an operatic stage and I will watch her developing career with great interest. Ward Stare was the conductor for both operas and he did a creditable job, as far as I could tell; unfortunately, one of the shortcomings of the Loretto-Hinton Center is the sound of the orchestra. The positioning of the players deep in the pit and partly under the stage helps to ensure excellent balance between singers and orchestra, but it also practically guarantees that loud climaxes have little or no impact. The explosive endings of both operas call for full-out fortissimos from nearly every member of the orchestra; it is the combination of double murders before our eyes and an orchestra reinforcing the drama with enormous volume that gives the horrific final moments of both tragedies their true operatic power. Opera Theatre of St. Louis has gotten almost everything else right about running an opera company; perhaps it is time to give some thought to improving the sound of the orchestra. The music deserves it - indeed, the music requires it! There is much to enjoy at the Opera Theatre of St. Louis: the picnics on the lawn before the performance; the partying with the artists at the end of the performance; the comprehensive, graphically outstanding program book; the imaginatively appointed lobby area, featuring large color photos of OTSL productions past and present, and last but not least, the excellent Preview presentation by repetiteur Damien Francoeur-Krzyzek before the performance. Lively and articulate, he knew both operas presented this evening intimately, and played and sang excerpts from each with impressive ease.